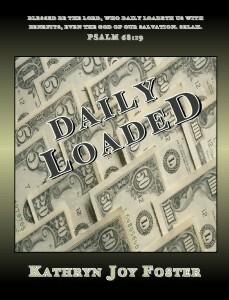 Synopsis: Daily Loaded 126-page self-study course in pdf format is fully loaded and equipped to move you influentially within the kingdom of God.Having the mind of Christ according the sound biblical principles you are certain to be fruitful, multiply, replenish, subdue and have dominion. There are at least three ways to invest in others. 1. You can give them a fish. 2. You can teach them to fish. 3. You can help them cast a vision that a fish belongs in the ocean. i. bust out at the seams and allow God to empty large deposits. This is an excerpt from Daily Loaded! a publication of Read All Over Publishing by Kathryn Joy Foster, Publisher and Author. Visit www.epagesoflife.com to browse and buy.